Chinese technology satellite. BX-1. 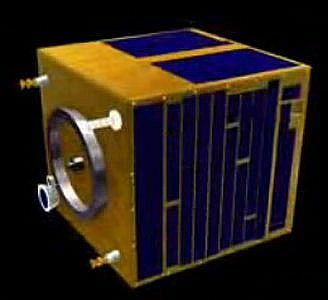 Ban Xing (companion satellite) subsatellite released by Shenzhou. If maneuvered away and back to the Shenzhou orbital module after the mission. AKA: BX;Chuangxin. Status: Operational 2008. First Launch: 2008-09-25. Last Launch: 2013-07-19. Number: 2 . Gross mass: 40 kg (88 lb). Family: Technology, Technology satellite. Country: China. Launch Vehicles: Chang Zheng 2F, Chang Zheng 4C. Launch Sites: Jiuquan, Jiuquan SLS. Chuangxin 3 - . Mass: 40 kg (88 lb). Nation: China. Class: Technology. Type: Technology satellite. Spacecraft: Ban Xing. USAF Sat Cat: 39209 . COSPAR: 2013-037B. Apogee: 673 km (418 mi). Perigee: 665 km (413 mi). Inclination: 98.04 deg. Period: 98.12 min. Served as target for the Shiyan 7 satellite inspector / robotic arm test vehicle..